Finding info on environmental enrichment for lab animals. At first glance, this seems like a pretty straight forward exercise. Go to PubMed, type in environmental enrichment, click search, be done. That is until you look at that first citation—Oxysterol-binding proteins. Ridgway ND. Subcell Biochem. 2010; 51:159-82—and realize that unless your mouse enjoys reading about sterol signalling her life is going to remain decidedly unenriched. In fact, of the first 20 citations retrieved using this simple strategy, only one record would provide information to help our mouse. So what do we do? How do we improve our strategy to improve our results? One simple solution is to know how to search on the database or platform you are using. Most systems, including PubMed (when we talk about PubMed, we also include Medline), allow you to use simple quotation marks to create a phrase; without them the search utility usually assumes you want records containing the words environmental AND enrichment, no matter where they appear in the record. Our mouse is learning to become a biochemist because that first record contained the phrase “enrichment of the plasma membrane” and later “a relatively cholesterol-poor environment.” Consequently, it met the criteria for being included in the retrieved records. To overcome this problem, if you aren’t familiar with how the database finds information, read the help section and learn how to properly use the system so you can search more effectively and more efficiently. Terminology is also very important. While everyone talks about “environmental enrichment” (EE), not everyone writes about “environmental enrichment.” Databases also have their own way of indexing the topic. While that phrase will certainly find information on the topic, it is not the only useful terminology. A look at PubMed will illustrate this. One of the wonderful features of PubMed is its MeSH (Medical Subject Headings) terminology. According to their website, “MeSH is the National Library of Medicine’s controlled vocabulary used for indexing articles for MEDLINE/PubMed. MeSH terminology provides a consistent way to retrieve information that may use different terminology for the same concepts.” When you search PubMed for information on “heart attack,” PubMed uses MeSH to “map” that term to the MeSH term “myocardial infarction” and other related terms. So without the searcher having to do anything, you will find articles related to “heart attack” even if the article doesn’t use that specific phrase. This is a very easy and powerful way to find information and many people rely upon it to ensure a comprehensive search of a topic. (Mapping doesn’t occur if truncation is used, e.g. heart attack*; the asterisk [*] is a truncation symbol). Unfortunately, there is no MeSH term for our phrase of interest. From a few quick and dirty searches of PubMed, EE-related articles are indexed using a variety of MeSH terms such as “Behavior, Animal,” “Environment,” “Environment, Controlled,” “Play and Playthings,” “Social Environment,” “Animal Husbandry/Methods,” and many others. I suspect that part of the problem is that PubMed is now indexing more animal welfare and animal husbandry-related articles and having to fit them into MeSH terminology that is geared more toward biomedical and clinical science. As you might imagine, other databases that are more focused on veterinary and animal science topics have an easier time managing this issue. Look at Agricola produced by USDA’s National Agricultural Library or CAB Abstracts produced by CAB International and you can jump into the EE literature using the phrase “environmental enrichment” because it is part of each database’s thesaurus. The Biosis database uses the phrase also. Knowing how information is indexed in the database you are searching can be useful in helping to retrieve quality information on your topic. As good as PubMed is, it is not the only source of information. Other databases, such as those mentioned above, will also provide information that may or may not be found in PubMed. While we won’t discuss it here, Google can also be very useful. If we use our phrase “environmental enrichment” and add in the terms “animal* or rat or rats or mouse or mice or rodent* or dog or dogs or cat or cats or bird* or avian or gerbil* or hamster* or primate* or rhesus, [The asterisk is a truncation mark and lets us search for plurals and other versions of the word.] and search across PubMed, EmBase, Agricola, CAB Abstracts, Biosis Previews, and PsychINFO, there are 4270 unique articles that are retrieved. PubMed contains 282, EmBase contains 83, Biosis contains 492, Agricola contains 552, CAB has 238, and PsychINFO has 2623. If you only looked in PubMed, you would miss 3,988 unique articles. Just as we emphasize with the search for alternatives, broaden your sources when looking for information whether it is alternatives, enrichment, or your science. As seen from the example, another good source for enrichment information, especially for the effects of enrichment on physiology, behavior, and development, is PsychINFO, produced by the American Psychology Association. When you’re searching for information to establish an enrichment program, to keep up-to-date with the latest findings, or determine the effects of enrichment on an animal model, it is best to use additional terms to find useful information. Enrichment programs can intervene in any aspect of the animal’s daily life and should take this into account. Enriched or standard housing, diet and the way it is presented to the animals, social groups vs. pair housing vs. isolation, toys and other manipulanda (HAD to get that word in here! ), running wheels, nestlets…All of these things can go into an enrichment program or a study on enrichment. The various databases discussed contain EE information from numerous scientific studies, if you can find it. Depending upon the platform searched, it can be easy or difficult to create phrases or to tell the system that you want two terms near each other in the article. Learn how the search engine works, so you can have better results. So here’s a short list of terms that I have used when searching for enrichment information. Add in your own terms to tailor the search to your specific needs. An agricultural and veterinary database produced by the US Department of Agriculture’s National Agriculture Library. Free. 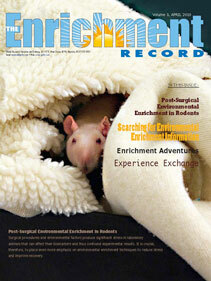 A portal to enrichment information produced by AWIC, Animal Care, and other organizations. Includes “Environmental Enrichment for Nonhuman Primates, 2009,” “USDA Perspective on Environmental Enrichment for Animals” and links to other sources of enrichment information. Free. This site will provide access to AWI’s Primate Enrichment Database and Database on Refinement of Housing and Handling Conditions and Environmental Enrichment for Animals kept in Laboratories, Environmental Enrichment and Refinement for Nonhuman Primates Kept in Research Laboratories: A Photographic Documentation and Literature Review, Making Lives Easier for Animals in Research Labs—Discussions by the Laboratory Animal Refinement & Enrichment Forum, Practical enrichment options (2008), Comfortable Quarters for Laboratory Animals (2002), and other quality resources. Free. Bio-Serv is a designer and manufacturer of an extensive line of environmental enrichment treats and devices. BIOSIS life sciences databases deliver current, multidisciplinary information on agriculture, biodiversity, biotechnology, drug discovery, gene therapy, marine biology, wildlife conservation, zoology, and other topics. Fee. Guidelines from the British Veterinary Association and other UK animal welfare organizations for dogs in research. Chapter 8 covers environmental enrichment specifically but the document, in general, discusses the needs of the dog in the research setting. In this online training program, the reader is introduced “to the concept of environmental enrichment, the elements involved in environmental enrichment, the effects of environmental enrichment within the research effort, and examples of environmental enrichment.” Examples are provided for all laboratory animals. Free. An article from the AWIC Bulletin by Kay Stewart, Associate Director of Freimann Life Science Center, University of Notre Dame, South Bend, Indiana. A wonderful site provided by the Fort Worth Zoo. According to the website, “The mission of this site is to provide professional animal managers, both in zoo and laboratory settings, a comprehensive resource for incorporating enrichment into the care and husbandry of captive animals.” Free. This issue of ILAR Journal provides valuable points of view about achieving high levels of well being for animals used for research. “The quality of housing and husbandry has a major impact on laboratory animal health and welfare. There is an expanding body of scientific literature to demonstrate that environments that do not meet animals’ physical, behavioral and/or social needs can result in changes in physiology and to abnormal behavior (e.g. stereotypes) which not only compromise animal welfare but also influence the validity and reproducibility of the scientific data obtained.” Free. PsychINFO provides systematic coverage of the psychological literature from the 1800s to the present. The database also includes records from the 1600s and 1700s. “PubMed lets you search millions of journal citations and abstracts in the fields of medicine, nursing, dentistry, veterinary medicine, the health care system, and preclinical sciences. It includes access to MEDLINE and to citations for selected articles in life science journals not included in MEDLINE.” Free. An article by AWIC’s Kristina Adams from the Proceedings of the 6th World Congress on Alternatives & Animal Use in the Life Sciences held in Japan in 2007.